The first time you play Dark Castle don't be surprised if your score doesn't even break 100. This is a game that requires practice, especially considering the unusual user interface. Dark Castle is one of those frustrating adventure games wherein the player must find just the right combination of moves to get past one screen and into the next. Each screen of Dark Castle is a puzzle that must be solved, and while you're trying to find your way to the next level, you must do your best to stay alive by killing off rats, bats, dragons, mutants and all other sorts of nasty creatures. Your mission is to make your way through the haunted castle's 14 levels (good luck) and find and overthrow the evil Black Knight. The first time you play Dark Castle, don't be surprised if your score doesn't even break 100. 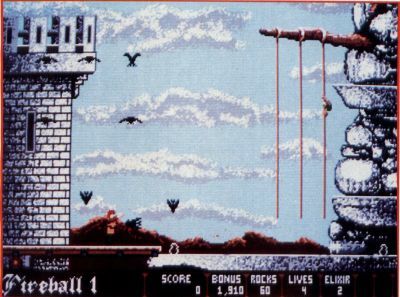 This is a game that requires practice, especially considering the unusual user interface One hand must be used on the keyboard to control your movement and the other hand must be used on the mouse to throw rocks. Believe me, you're going to have master these controls before you have any chance of getting very far in this game. The graphics and animation in Dark Castle are high quality. The sound adds a lot of charm to the game, and you'll sometimes find yourself smiling. One of my favorite sounds is the one you'll hear when you hit one of the "mutants" with a rock—a squeak that brings to mind someone stepping on a mouse. Your hero can walk in four directions: left, right, up and down—as well as jump. In order to rack up any kind of a score, you're going to have to have both hands functioning like a finely tuned machine. Don't let your hero fall off a platform. If it's just a short fall, he'll walk in circles (and make amusing groaning sounds) for a couple of seconds, dizzy from his hit on the head. During that time you're helpless and vulnerable to attack. If you fall too far, you lose a life. The program comes on three floppy disks, and if you plan on running the program from these disks, you'd better be prepared to do a lot of waiting for disk access and to do a lot of disk swapping. Luckily the program can be copied to a hard disk or a RAMdisk, speeding up the transitions considerably. But even when not running the programs from the floppies, you must keep Disk A in Drive A; Dark Castle uses the "key disk" copy protection scheme. The "manual" consists of one 5 ½- inch by 8 ½-inch card. Like many adventure games of its type, Dark Castle expects you to figure out the details of the game. The instructions tell you little more than the fundamentals of movement. If you're willing to spend a lot of time practicing, you'll probably find Dark Castle to be a fun-filled challenge. If, however, you frustrate easily, you should pass this one up.